Cole Swindell, Thomas Rhett, Kellie Pickler, Scotty McCreery, and the LoCash Cowboys. 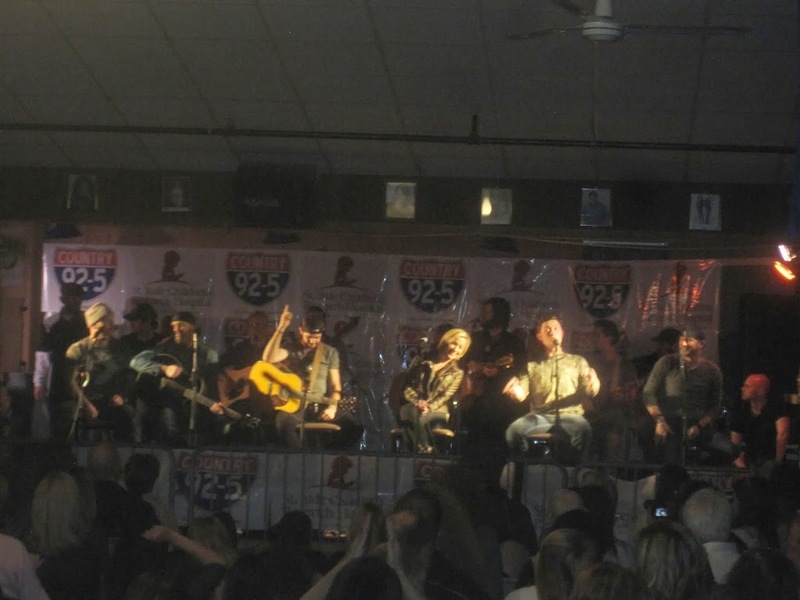 Each year, Connecticut’s Country Music radio station puts together an acoustic show at the Cadillac Ranch, in Southington, CT. The show is a benefit for St. Jude’s Children Hospital in Memphis, TN, a charity country music singers have always greatly supported. This year’s show included Cole Swindell, Thomas Rhett, Kellie Pickler, Scotty McCreery, and the LoCash Cowboys. This year’s event seemed to draw an even bigger (and rowdier crowd) than in years past. 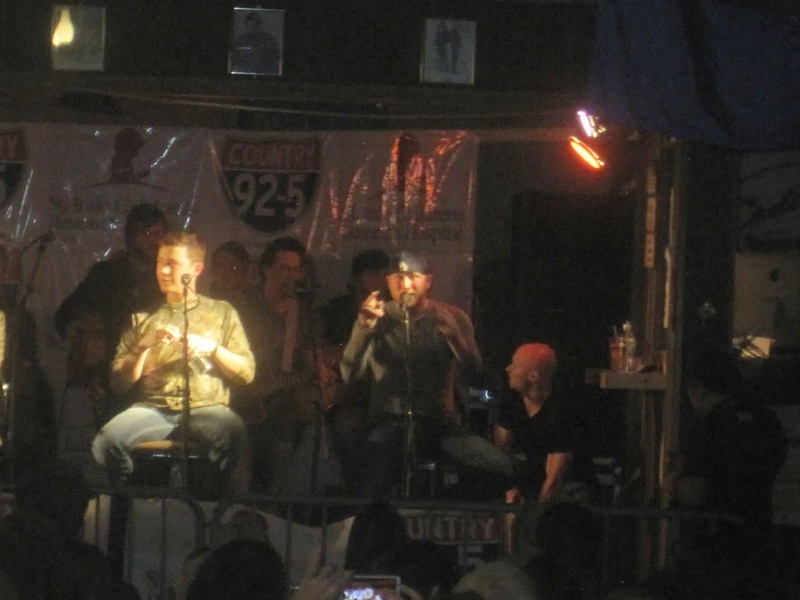 Broadway and Cory, Country 92.5’s Electric Barnyard morning show introduced the artists and each of them sat on a stool next to each other. The rest of the night followed a guitar pull, in which each artist takes turns down the line playing a song of their choice. First up was the LoCash Cowboys. They are very entertaining performers who tend to blend genres with a Hick-Hop type of vibe. However, they were most convincing on their emotional song “Best Seat In the House” written for one of the member’s deceased father. Their final pull was a combination of songs they have written for some of country music’s superstars, Keith Urban (You Gon’ Fly) and Tim McGraw (Truck Year). The entire crowd was on their feet singing along word for word. 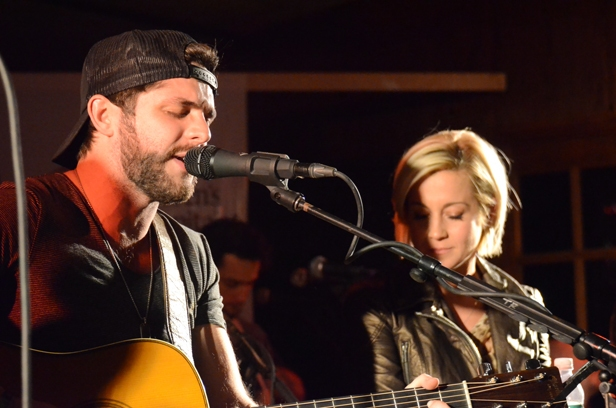 The second artist was Thomas Rhett, who has quickly risen from a talented Nashville songwriter to a solo artist with star potential. He started with “Make Me Wanna” and threw in a little Justin Timberlake/Jay-Z “Suit & Tie” at the end of it. He, of course, played his #1 hit “It Goes Like This” and sang the #1 song he wrote for Florida Georgia Line, “Round Here”. He even freestyle rapped on one of LoCash Cowboy’s songs. 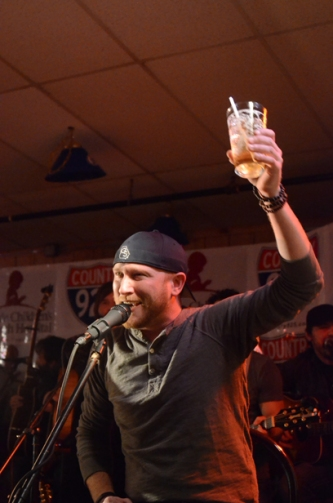 However, what I thought was the highlight of the night, was when he and Cole Swindell collaborated on his new single “Get Me Some Of That”, which happened to be co-written by Cole. 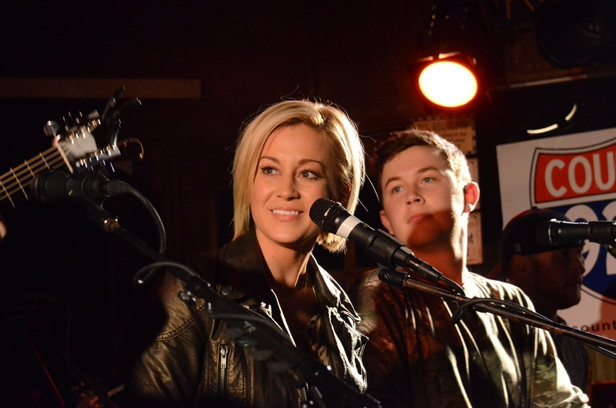 Kellie Pickler was next on the stage and she added some background to each of the songs she sang. “Red High Heels” got the biggest reaction of all of her songs, but the song about her grandmother, “Selma Drye” stood out the most to me. It is a true story about her gradmother who she knows she got “her crazy from”. Kellie was the only woman on stage and more than held her own. Her voice was soulful and she looked as beautiful as ever. American Idol alum, Scotty McCreery was next and he ran through a mix of his new songs. His deep, resounding voice boomed through the speakers on his four songs. “Water Tower Town” had a huge reaction from the crowd, but it was “See You Tonight” that was arguably the best vocal performance of the night. He explained to the crowd that it was his first single to make the top 10 and it is still climbing. I had never seen Scotty live before and I was very impressed with his vocal performance. Cole Swindell was last but certainly not least. He was, by far, the most charismatic of the performers and seemed to get the biggest response from the crowd. He was into each of his other artists’ songs encouraging the crowd to clap and was constantly pumping his fist. His songs off his new album such as “Brought To You By Beer”, “Ain’t Worth the Whiskey” and “Hope You Get Lonely” got reactions from the crowd as if they had been released for years, not just one week ago. However, his final song, “Chillin’ It”, which is currently the #1 song in the Nation, got the biggest response. He was extremely humbled and appreciative of the crowd, his fans, and his fellow artists’ support. The night ended with the entire cast singing Garth Brooks’ “Friends In Low Places” with Scotty McCreery taking the reigns on the final “hidden” verse. After the show ended, the artists sat in line and signed autographs for one hundred fans. All the money was dedicated to St. Jude’s and the night was a complete and utter success, once again. I commend Country 92.5 for putting on this annual event which helps such a worthy cause. 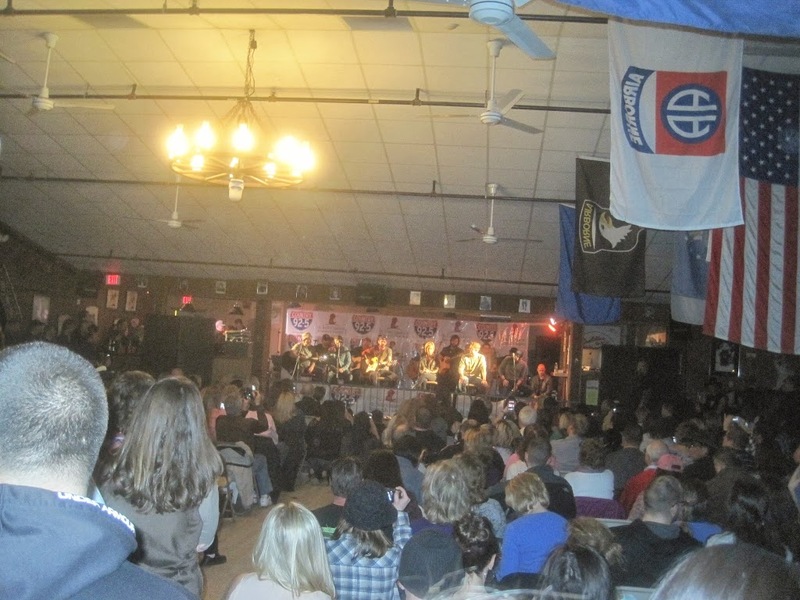 Each year, Connecticut’s Country Music radio station puts together an acoustic show at the Cadillac Ranch, in Southington, CT. The show is a benefit for St. Jude’s Children Hospital in Memphis, TN, a charity country music singers have always greatly supported. This year’s show included Jerrod Niemann, Jana Kramer, Dustin Lynch, and Randy Houser. Before the show, the ticket holders lined up in the cold to get entry to the Cadillac Ranch. Jerrod Niemann appeared and walked up and down the line greeting fans, taking photos, and making jokes. I caught up with him and cracked some jokes about the time we spent on the Blake Shelton Cruise this past October (see: http://millertimemusicspot.blogspot.com/2012/10/the-blake-shelton-friends-cruise-review.html). He joked with me, saying: “those were better, warmer times. Also blurrier times”. I thought this accessibility to the fans was a classy move by Jerrod and it made the time spent by the fans on line a lot easier. The show consists of a guitar pull, as each of the artists stay on stage the whole time, joining in on each other’s songs. 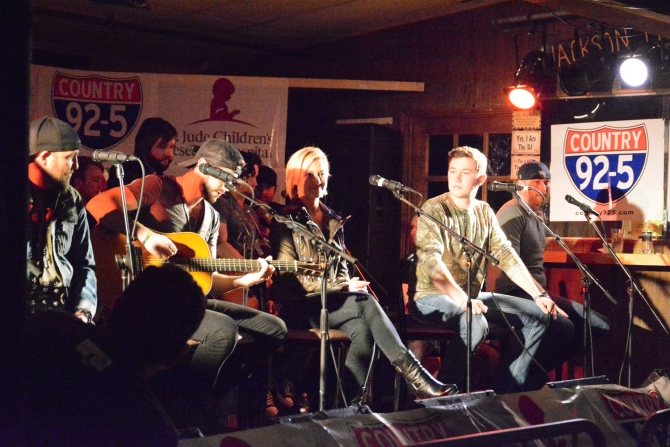 Jerrod carried the show’s banter, as he added numerous jokes and comments about each of the artists. He even added a baseball themed song about an old man getting hit by a ball that had everyone cracking up. Jana Kramer tried to add into the banter and discussed a bit of her new engagement with Brantley Gilbert. She got a huge round of applause when she sang her new single “Whiskey” and “Why You Wanna” became an instant sing-a-long with the crowd. The actress (One Tree Hill, Entourage) turned singer’s live voice has improved each time I have seen her perform. 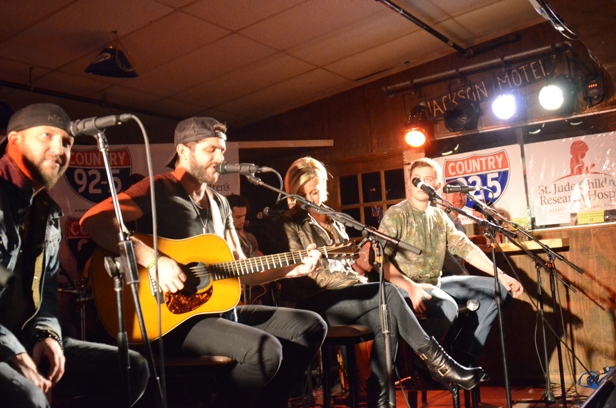 Jerrod sang his top four hits, including a slower version of his new single, “One God Can Love You More” The slower, acoustic version added to the beautiful lyrics of the song, which he co-wrote with Lee Brice. All throughout the show, Jerrod was making jokes, but there is no comedy when it comes to his music as he is a true hit-maker. When he belted out “Lover, Lover” during the last pull, the crowd may not have been louder all night. Dustin Lynch had the girls in the crowd straight giddy as I overheard numerous comments about his looks. But his voice is most impressive about him. Backed by a ridiculously impressive guitarist from his band, Dustin took us through four of the cuts from his debut album. But “Cowboys & Angels”, his first #1 single, was the absolute highlight of the whole night. One of, if not the best country song of the year had all the significant others in the crowd holding on to each other tight. I expect great things from him in his career. Randy Houser has one of the best vocals in music today. And in the intimate Caddy Ranch, those booming vocals were straight bombastic. He soared on “Like a Cowboy”, had the place rocking during “Boots On”, and his new single, “Running Out of Moonlight” had people ready to immediately request it on Country 92.5. The final song of the night was very fitting as his first #1, “How Country Feels” was belted out by Randy as well as every last person in the crowd. 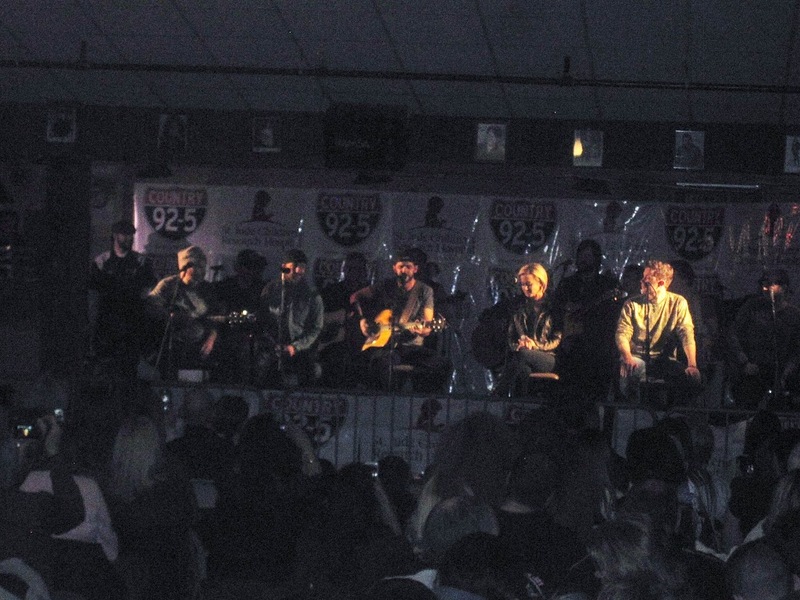 Each of the artists was on point and were quick to acknowledge both Country 92.5 and St. Jude’s Hospital. I am proud to have donated to St. Jude’s as well as attend this event the past five years. There was a poster signing at the end of the night, where those who bought the posters could meet the artists and get their signatures. An overall classy evening where it’s always great to see musicians get together for a worthy cause.